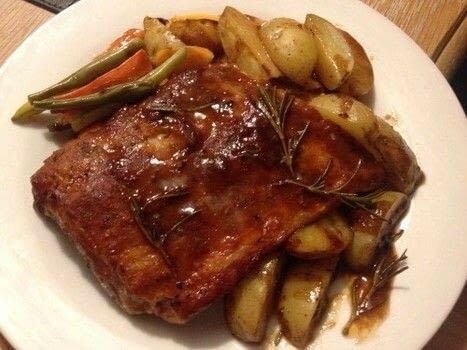 https://www.cutoutandkeep.net/projects/bbq-ribs-and-roasted-veggies • Posted by Shirin L.
Using only your oven to cook a hearty main course. Inspired by my brother's love of Epic Meal Time. Preheat your oven to 180- 200'C and line your baking tray with foil and cut all your veggies into thin strips. Place the veggies on the foil going round from the outer edge in - save space for the ribs in the center. Wrap all the ingredients by placing another layer of foil over the tray to ensure a faster cooking in the oven and to prevent the ribs from losing their moisture. The juice of the meat will drip over the vegetables to give them more flavor. Cook in the oven, for abut 20 minutes bearing in mind the longer you leave the meat in the more fat will drip over your veggies, thus your veggies will not only bake but fry in the oil of the meat as the ribs get dryer. 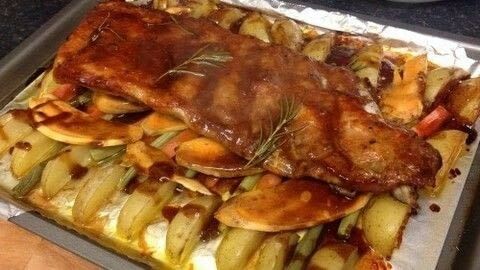 Remove the ribs and roast vegetables from the oven and take off the foil. Slice the ribs to check they're fully cooked then serve fresh from the oven. Tip: Use your hands to eat the food, it's messy but you'll enjoy it more.